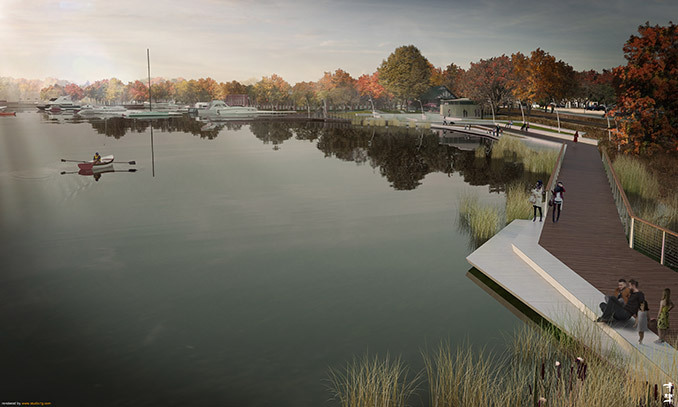 Civitas has received City Council approval to move forward with the design of implementation plans, and construction documents for the Lake Effect Project to revitalize the Lake Minnetonka waterfront for the City of Wayzata, Minnesota. A strategic initiative to enhance Wayzata’s character and connectivity to Lake Minnetonka, the project is intended to create a more beautiful area for residents’ everyday use. “The Lake Effect Project strikes a good balance between supporting downtown businesses while improving community recreation, relaxation and pride,” says Civitas founder and president Mark Johnson. Civitas was the selection committee’s unanimous choice in the original 2015 design competition for the project and has been closely involved in Wayzata’s intensive community engagement and collaboration process through development of the vision. Planned improvements along Lake Minnetonka’s northern edge will extend from the 1902 Section Foreman House to the historic Depot Park, allowing residents, for the first time in 100 years, to be able to walk the length of the downtown shoreline where a working railroad corridor has restricted access. At the same time, the project will restore and enhance overall lake-edge ecology. 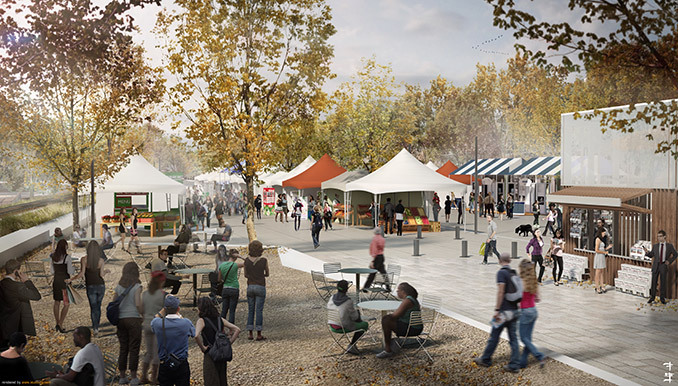 And a redesign of adjacent Lake Street, which fronts the downtown retail district, will add bike lanes and widen sidewalks to enhance the bicycle and pedestrian experience, with a lively, all-season plaza replacing the former municipal parking lot, offering built-in flexibility for large festivals, smaller summer markets and even winter activities like broomball or curling. The Civitas plan provides an open and continuous meandering wooden boardwalk, engaging users through a series of diverse interconnected spaces that provide fresh access to the lake and an increasingly natural experience of the landscape. “The boardwalk system is designed as a quarter-mile loop to put the waterfront park in motion and enhance social interactions,” explains Jordan, “enabling residents to stroll, sit, fish or dip their toes in the water.” The concept draws directly on Civitas’ ethos of activating people and places, successfully realized in the firm’s completed urban waterfront projects ranging from San Diego’s North Embarcadero to St. Patrick’s Island Park in Calgary, Alberta. On the shoreline’s east side, an Eco Park will feature an underwater reef to mitigate damaging wave action and restore a historic shoreline marsh. A community education center is planned within the restored historic Section Foreman House. 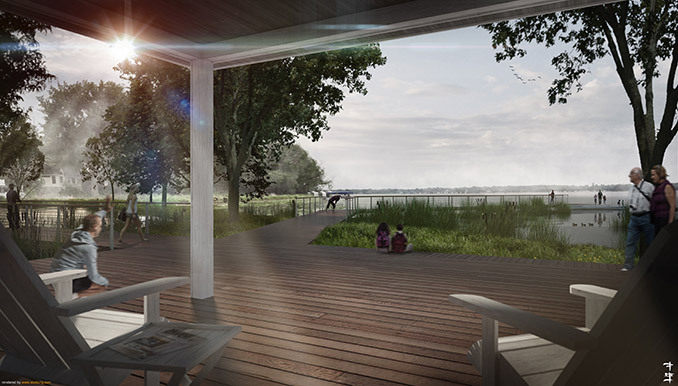 Expanded terraces, flower gardens and much-needed shade and restroom facilities around Wayzata’s historic Depot Park area will anchor the shoreline’s western edge and provide an enticing destination for those on the Lake Walk loop. As the City of Wayzata moves forward with the Lake Effect Project, Civitas and its multi-disciplinary team of consultants – including Snow Kreilich Architects (Minneapolis); Applied Ecological Services (Prior Lake); Solution Blue, Inc. (St. Paul); LKPB Engineers, Inc. (Minneapolis); Water In Motion (Minneapolis); SRF Consulting Group Inc. (Minneapolis) and Ericksen Roed & Associates (St. Paul) – will continue to develop the design for the entire project. 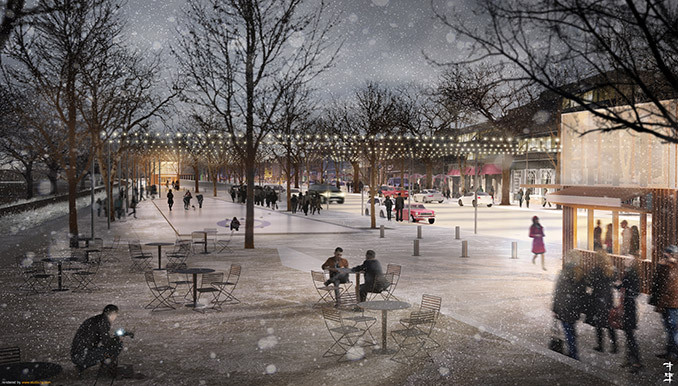 Construction on the Lake Street and Lake Street plaza improvements is slated for 2019.